Pet Emergency? Call us right away at (845)-336-4053! At The Lake Katrine Animal Hospital we aspire for excellence with our high standard of care, our compassion for our Patients, and dedication to educating our Clients. We take Pride in the quality care we provide as well as the care and respect we show our Patients. If you live in Lake Katrine or the surrounding area and need a trusted veterinarian to care for your pets – look no further. 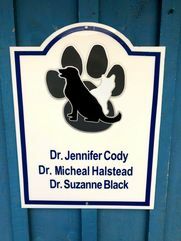 Dr. Jennifer Cody, Dr. Michael Halstead, and Dr. Sue Black are licensed NY veterinarians, treating all types of pets. Your pets’ health and wellbeing are very important to us, and we take every possible measure to give your animals the care they deserve. 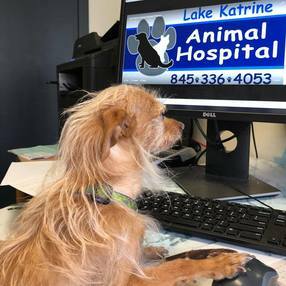 Lake Katrine Animal Hospital is a full-service animal hospital and welcomes both emergency treatment cases as well as pet patients in need of routine medical, surgical, and dental care. Dr. Cody, Dr. Halstead, and Dr. Black have years of experience treating serious conditions and offering regular pet wellness care. Beyond first-rate pet care, we make our clinic comfortable, kid-friendly, and calm, so your pet can relax in the waiting room and look forward to meeting our Lake Katrine veterinarian. We are happy to offer a number of resources that enable you to learn about how to take better care of your pets. Please feel free to browse our site, particularly the informational articles. The best veterinary care for animals is ongoing nutrition and problem prevention, so becoming knowledgeable about preventative pet care is essential to the ongoing success of your animal’s health. If you have any questions, call (845)-336-4053 or contact us and we'll promptly get back to you. Our Lake Katrine veterinarian office is very easy to get to - just check out the map below! We also welcome you to subscribe to our newsletter, which is created especially for Lake Katrine pet owners. At Lake Katrine Animal Hospital, we treat your pets like the valued family members they are. Dr. Michael Halstead has been with LKAH since 2001. He did his undergraduate studies at SUNY Binghamton. He graduated from Ross University School of Veterinary Medicine in 1991.Dr. Halstead is a competitive triathlete and leads training sessions at the YMCA. He and his dog Kai were featured in a story in Runner’s World magazine. Dr. Halstead lives in Stone Ridge NY with his wife Shelly and his son Drew. "Very friendly staff, knowledgable. Many vets I've been to rush me out the door, these Drs take their time explaining things to you. Thanks Dr Cody!!!" "The most compassionate and knowledgeable vet ever. Takes his time with your pet, talks to you in a straight kind way about your dog as if they are a person...Because of course they are. Dr Mike rocks!"